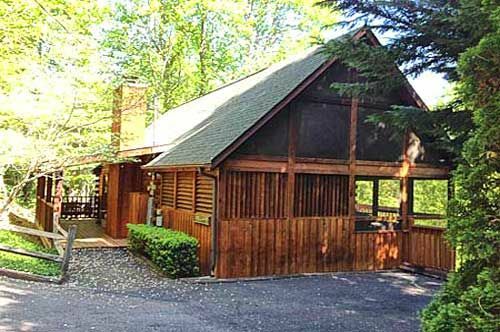 Hunters Lodge is a great 1 bedroom 1 full bath cabin that offers you comfort and convenience. This cabin is just a 10 minute drive from all of the hustle and bustle of Pigeon Forge. Sit back and enjoy the porch swing on the covered front deck. Take in the beautiful sounds of nature as the birds sign away. Step on in and you will feel right at home. This cozy cabin has an open floor for the kitchen, dining and living areas. The fully equipped kitchen has everything you will need for preparing snacks to full meals. The dinning area has plenty of seating for 4 people. Enjoy your favorite show or a movie while sitting back and relaxing in the living area. This area has a built in cabinet that houses the TV with DVD Player. During those cool fall or winter nights enjoy warmth of the wood burning fireplace. In the private bedroom, you will find a king size bed with TV and DVD Player mounted for your viewing pleasure. The full bathroom is also attached to the bedroom. In the bathroom you will find a large indoor jacuzzi tub that looks out at the beautiful wooded area. There is also a shower stall for bathing. Back in the bedroom, you will find a washer and dryer combo unit. From the main living area, step outside onto the screened in deck area. Sit back and relax in the hot tub after a day in town. Or grill up some food on the gas grill provided and have a romantic dinner outside with the patio table and chairs provided. Feel the warmth of the sun, and step outside of the screened in deck onto the back open deck area. Sit back and enjoy your surroundings while rocking the afternoon way. This cozy 1 bedroom cabin has all of the modern comforts of home, including wireless internet. Do not just picture yourself here, get here and enjoy all this cabin has to offer. Do not hesitate and book your dates now. Hope to see you real soon. walls are covered in cob-webs, sink was nasty, coffee pot had to be cleaned. We paid in advance a cleaning fee but had to clean ourselves? As a member of your services we strive to be better, but this unit needs some attention .